I am so amazed at how well they blend economics and entertainment. The tune is catchy and we’re all humming it around the house… I also like how they make both men nice guys and friendly with each other. But my favorite part…and it just awes and mistifies me every time…is the subtly of the scene where Keynes is down, the guy in the ring is counting 1, 2, 3…while in the background shots fat cats exchange money. 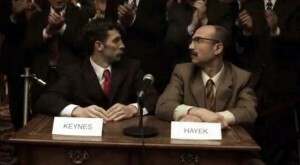 Then, all of a sudden, Keynes stands up and he’s declared the winner. He looks shocked for a second, but then runs with it, while Hayek, the clear winner in real terms, gapes in puzzlement. That bit is so cool, so subtle (you have to really watch for it) and so true to life–and to what is happening in our governments world wide–I find it just…wow.